Residents of Kochi Prefecture in the Shikoku region will be the first to start getting smashed in parks as early as March 18, according to the Japan Meteorological Agency. “I can’t wait to get sloshed either under or in the vicinity of a tree,” says 24-year-old salaryman Jingo Haratara. Last year, intoxicated salarymen were also seen unusually early under cherry blossom trees in Tokyo on March 17. JMA forecasts Kochi drunkards to be followed by an emergence of Fukuoka drunkards on March 20. 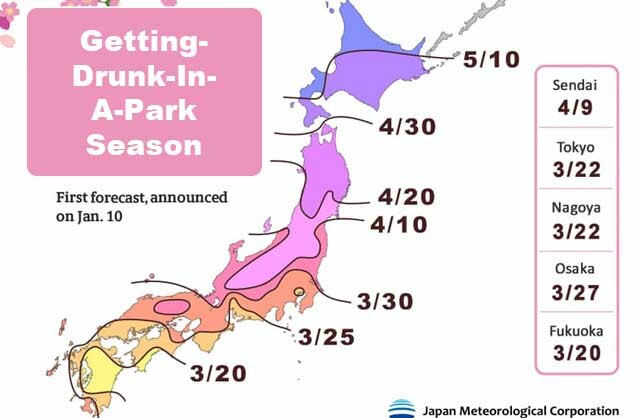 Drunk-in-a-park season is predicted to begin on March 22 in Tokyo and Nagoya, March 25 in Kyoto, and March 27 in Osaka.